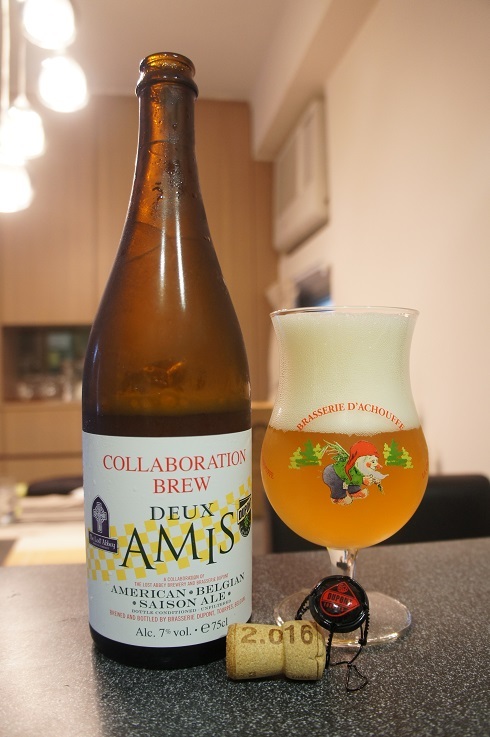 Brewer Description: (from bottle) French for “two friends,” Deux Amis commemorates the ground-breaking collaboration between Belgium’s Brasserie Dupont and America’s Lost Abbey Brewery. 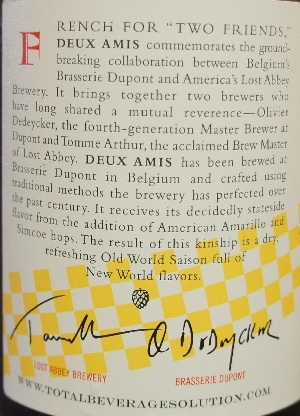 It brings together two brewers who have long shared a mutual reverence – Olivier Dedeycker, the fourth-generation Master Brewer at Dupont and Tomme Arthur, the acclaimed Brew Master of Lost Abbey. 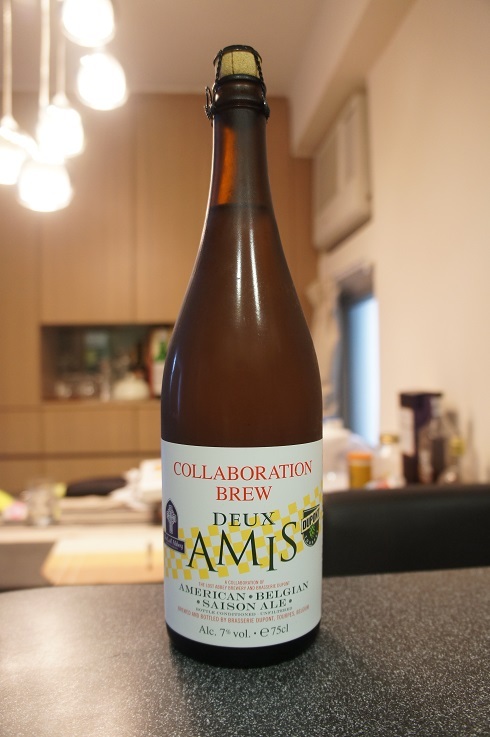 Deux Amis has been brewed at Brasserie Dupont in Belgium and crafted using traditional methods the brewery has perfected over the past century. It receives its decidedly stateside flavor from the addition of American Amarillo and Simcoe hops. The result of this kinship is a dry, refreshing Old World Saison full of New World flavors. Intro: A corked and caged 750ml bottle, 2016 cork with a best before date of May 2018. Poured into a d’Achouffe tulip glass. Appearance: It poured a cloudy golden orange colour with a huge three finger white head that had decent retention and left foamy sticky lacing. Aroma: Strong Belgian yeast, clove, banana plus melon with a touch of lemon zest, orange and white pepper spice. Taste: Lightly doughy, approaching overripe banana sweetness, clove, lemon zest, orange rind, honey, grass and pepper spice. Mouthfeel: Crisp, medium to light bodied with lively moderate to high carbonation and a dry finish. Overall: A good refreshing Saison that is easy to drink. Good stuff from two brewery/brewers that I like.